The massive Pacific Standard Time: Art in L.A. 1945-1980 is an unprecedented collaboration between 60-plus cultural institutions coming together to celebrate the birth of the LA art scene. Pacific Standard Time (PST) launched in October 2011 and is taking place over a six-month period, encompassing every major LA art movement from 1945 to 1980. Institutions of every size and character are participating, from heavyweights like the Getty Center and LACMA to art galleries, university museums and programs. Though PST is concentrated in greater Los Angeles, exhibitions are being featured as far south as San Diego, Santa Barbara to the north, and east to Palm Springs. By documenting the impact that Los Angeles has made on the postwar global art scene, PST has sparked interest and inspired visits from people throughout the region, across the country and around the world. Pacific Standard Time has also inspired Art as an Appetizer, a collaboration between chef John Sedlar, artist Ron Cooper (founder of Del Maguey Single Village Mezcal), and mixologist Julian Cox. The trio worked together to create a unique PST-inspired Secret Menu available now at Sedlar’s Playa and Rivera restaurants. 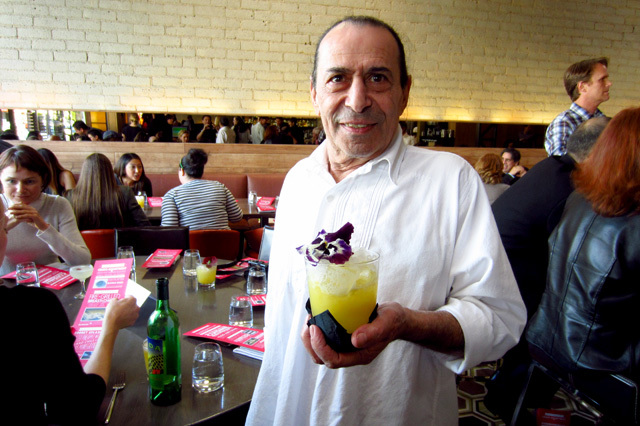 To celebrate the launch of the Secret Menu, Playa hosted an afternoon gathering that welcomed an eclectic mix of media, foodies and art enthusiasts, and three of the iconic Southern California artists who inspired the Secret Menu: Cooper, Oscar Castillo and Larry Bell. 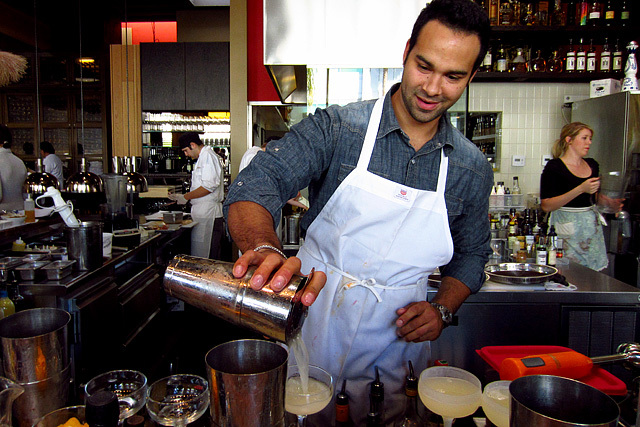 The event began with Cox’s PST-inspired drinks, each one made with a different Del Maguey mezcal. First up was the Ball Drop: Del Maguey Vida, London dry gin, fresh lime, yuzu tincture, topped with a dusting of cayenne. 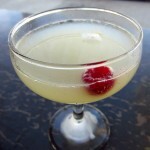 Based on a very unscientific poll, this seemed to be the consensus favorite cocktail of the afternoon. Cooperʼs 1969 Ball Drop video is part of the Collection of the University Art Museum Art Video Archive at Cal State Long Beach University. For visual appeal, the winner was the tiki-esque ‘47 Chevy in Wilmington, CA: Del Maguey Minero, agave nectar, St. Vincent Orgeat, passion fruit, fresh lemon and lavender air. 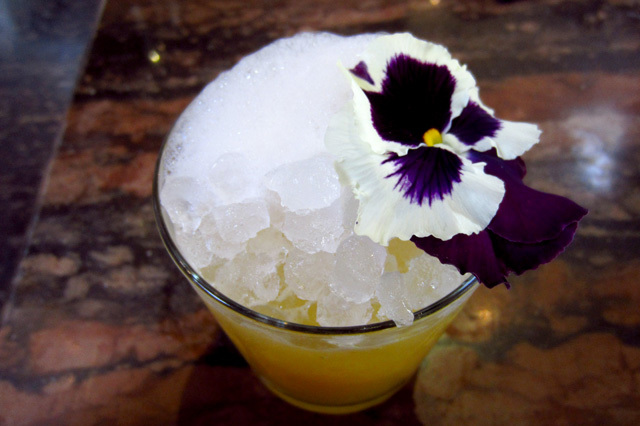 Cox evokes Castilloʼs 1972 photo with the drink’s matching yellow color as well as the contrasting white foam-dark pansies to symbolize the lowrider’s whitewall tires. ’47 Chevy in Wilmington, CA is featured in Icons of the Invisible: Oscar Castillo at UCLA’s Fowler Museum. 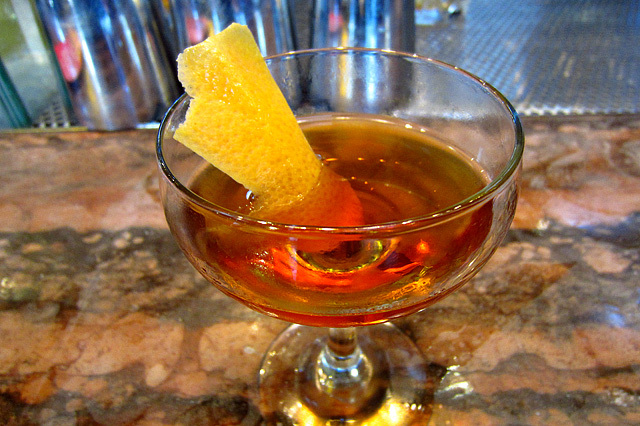 Cox said that when he saw Bellʼs 1964 Untitled glass cube, he immediately thought, “Manhattan.” The result is my favorite of the three PST cocktails, a delicious aromatic made with Del Maguey Chichicapa, Cocchi Vermouth di Torino, oloroso sherry and grapefruit peel. Bell’s Untitled is featured in the Phenomenal: California Light, Space, Surface exhibition at the Museum of Contemporary Art, San Diego. After we were seated, Cooper gave a quick primer on mezcal, talked about art as food for the soul and food as art, then ceremoniously poured some Del Maguey on the floor to make a cruciform. Sedlar then spoke about his process for creating the PST menu. He said he was grateful for the opportunity to look at any PST artwork that he wanted, before he chose three pieces that he felt were not only representative of PST, but could provide the necessary culinary inspiration. The meal began with a beautifully arranged crudo assortment of fresh and smoked seafood with kumquats, Fresno chiles, lime, red seaweed, and a copita of Chichicapa mezcal (sipped in a toast with Cooper). 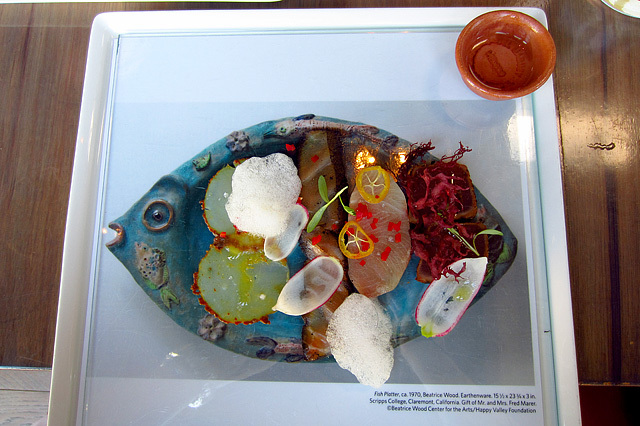 The gorgeous appetizer was inspired by Beatrice Woodʼs Fish Platter (1970), featured in the Beatrice Wood: Career Woman-Drawings, Paintings, Vessels, and Objects exhibition at the Santa Monica Museum of Art. 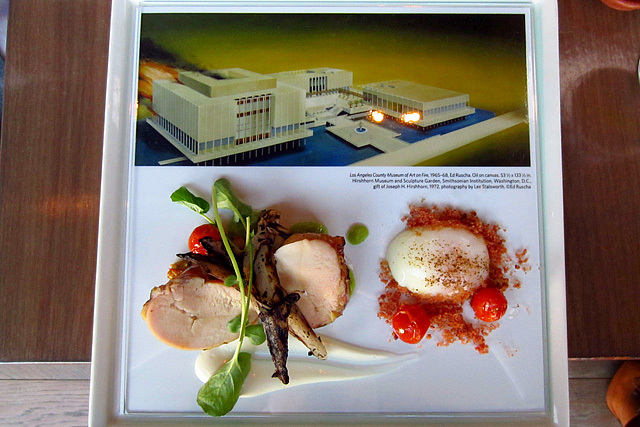 The main course was inspired by Ed Ruschaʼs Los Angeles County Museum of Art on Fire (1965-1968): fire–grilled breast of chicken with Cobb salad quemado, goat cheese and “incendiary” salsa. The moist, perfectly-cooked chicken represents the “burning” LACMA; piercing the accompanying poached egg and swirling in the bacon and salsa completes the fiery illusion. Ruschaʼs painting is featured in the Crosscurrents in LA Painting and Sculpture 1950-1970 exhibition at The Getty Center. Dessert was a colorful trio of sorbet “splashes” of roasted pineapple mezcal, poblano chile lime and hibiscus pomegranate, served with a shortbread cracker. 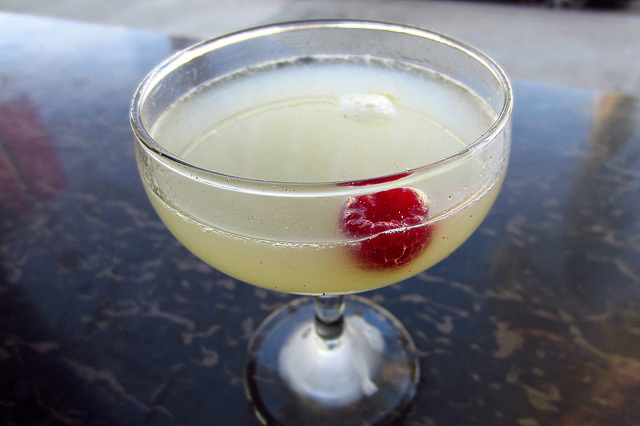 The lime far and away eclipses the others, a wonderful mix of tart and spice that I didn’t want to end. 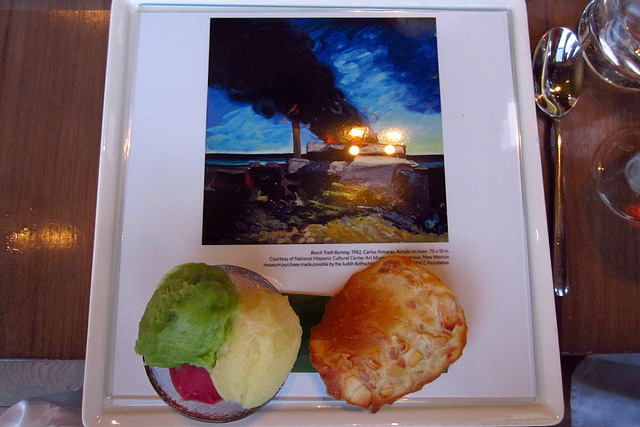 The dessert was inspired by Carlos Almarazʼs Beach Trash Burning (1982), a painting featured in the Mapping Another LA: Chicano Art Movement exhibition at the Fowler Museum, UCLA. The Secret Menu is available now through March 31st at both Playa and Rivera to customers who show PST museum proof of admission, or ask for the “Pacific Standard Time Secret Menu.” The menu is available during dinner only and is listed at $37 for three courses, although each course is available individually as well. For more photos from the Art as an Appetizer event, visit the Thirsty in LA Facebook page.